When I first saw this headline, I thought it was some kind of strange joke or something. Sadly, it is not. Here's the story via an official statement from the University of Massachusetts [link]. AMHERST, Mass. 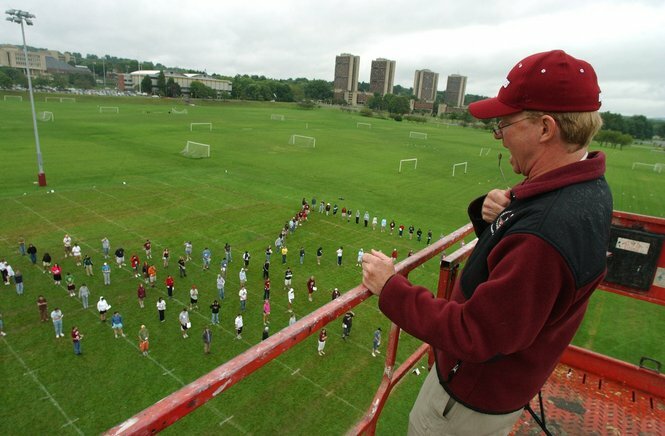 - Music professor George N. Parks, who led the Minuteman Marching Band to national prominence during his 33-year career, died Sept. 16 after suffering an apparent heart attack following a performance in Ohio. Parks, 57, and the band were en route to Michigan to perform at Saturday's football game at the University of Michigan in Ann Arbor. Despite the loss of their director, band members have decided to play at the game, according to Jeff Cox, who chairs the Department of Music and Dance. A nationally recognized band leader, Parks' charismatic persona inspired thousands of band members who devoted endless hours to drills, practices, road trips and public performances while also pursuing their academic studies. "This is an extraordinary loss," wrote Chancellor Robert Holub and James Staros in an e-mail to the campus community. "George's devotion to excellence, his creativity and his passion for teaching inspired us all and shaped the lives of thousands of students during the three decades that he directed The Power and Class of New England. Truly, he represented the best of UMass." After doing my Q&A with UMass blogger Minutemen Nation, I realized that UMass fans are very proud of their band, and take them very seriously. I'm sure Michigan fans can relate. The UMass fans were very excited to have their band play at Michigan Stadium along with the UofM band. This is a tragic story. My prayers go out to the family and friends of Mr. George Parks. I am happy that the band has decided to play at Michigan Stadium tomorrow anyway. I'm sure its what their band director would have wanted them to do.